Woohoo! 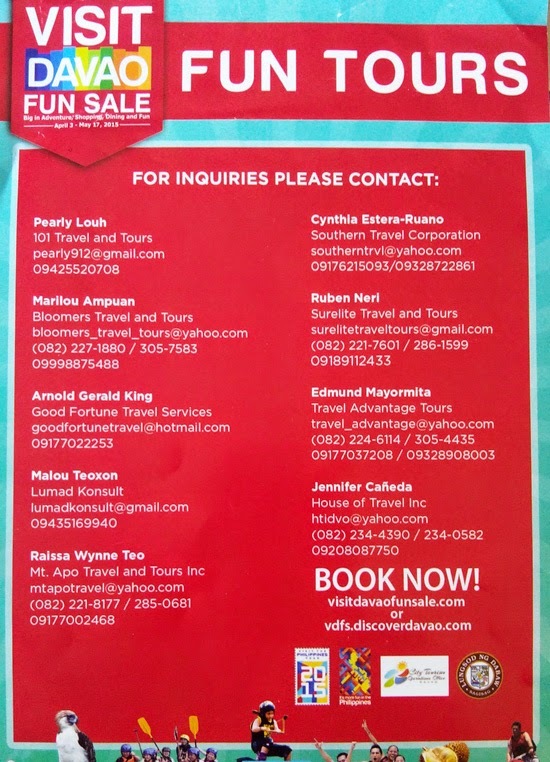 Davao City is all set to begin ‘Visit Davao Fun Sale 2015’. This is a summer sale extravaganza which will kick-off April 3 and will end on May 17, 2015. 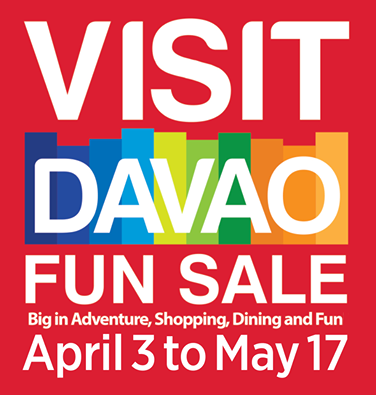 It will be a 6-week long city-wide sale offering happy faced discounts on practically everything you can think of around town – dining, shopping, spa, events, entertainment, resorts and hotels and this year’s highlight - Davao fun tours and tour packages. And yey! 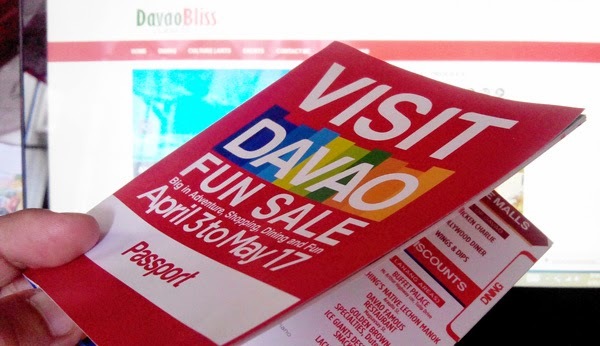 I got my passport to ‘Visit Davao Fun Sale 2015’, thank you DOT for this. It’s a 12-page booklet guide to what, where, how much discount and of course, freebies I can get at participating establishments during the fun sale period. These passports are given free at the airport, partner hotels and assigned booths in all participating malls and shopping centers in the city, in which apparently all malls in town are. But I suggest, download Visit Davao City Life Bit App on Google Play Store to save you time and less hassle. It’ll be ‘Big in Adventure, Shopping, Dining and Fun' in Davao City! 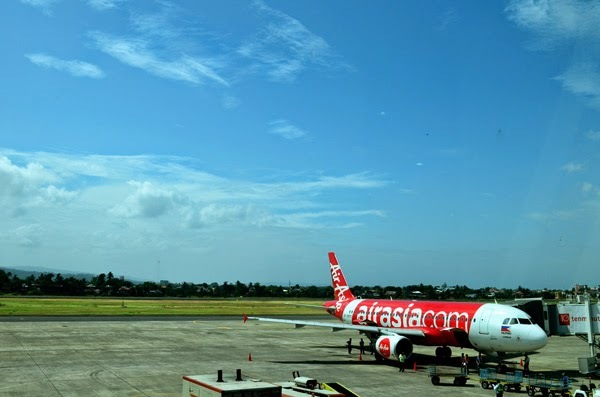 Air Asia Philippines, the country’s low cost carrier has re-launched their Manila-Davao route. Their first flight landed at F. Bangoy International Airport on March 27, 2015 and I’m one thrilled blogger I’ll be saving bucks on my next Manila flight with this resumption. 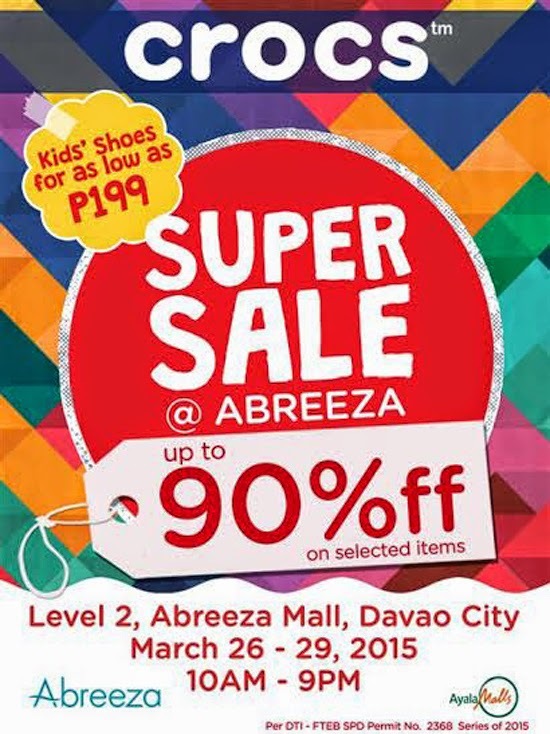 CROCS SUPER SALE IN DAVAO STARTS TODAY! 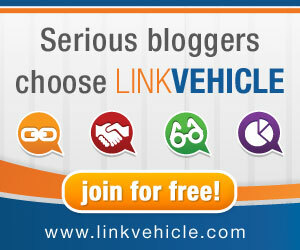 Love Crocs? I’m one crazy earthling loving their products. They’re a little pricey though but you always get what you pay for, they’re durable, they’re comfortable and designs are ergonomic and always in style. Guess what? They’re dropping price again and it’s happening TODAY!!!! Get your comfy pair today at Ayala Abreeza Mall in Bajada, Davao City and enjoy rock bottom discount of up to 90% off on great selections. CROCS SUPER SALE starts today, March 26 up to March 29, 2015. They’re open on mall hours, 10am to 9pm at the Second Level of Ayala Abreeza Mall. This is so timely, a perfect summer foot partner, grab your most comfy pair today! Crocs, Inc. (NASDAQ: CROX) is a world leader in innovative casual footwear for men, women and children with more than $1 billion in annual revenue. The company offers several distinct shoe collections with more than 300 four-season footwear styles. All Crocs™ shoes feature Croslite™ material, a proprietary, revolutionary technology that gives each pair of shoes the soft, comfortable, lightweight, non-marking and odor-resistant qualities that Crocs wearers know and love. Crocs celebrates the fun of being a little different and encourages fans to “Find Your Fun” in every colorful pair of shoes, from the iconic clog to new sneakers, sandals, boots and heels. Since its inception in 2002, Crocs has sold more than 200 million pairs of shoes in more than 90 countries around the world.